In the late 1930's (Show Period 14), two sides in Japan are conflicted between joining Germany and Italy in a military alliance. At this time, Isoroku Yamamoto, who strongly opposed the alliance, is appointed Commander-in-Chief of the Combined Fleet. The following year, on September 27, Japan, Germany and Italy form the Axis alliance. Isoroku Yamamoto leads the attack on Pearl Harbor on December 7, 1941. The attack's main purpose is to gain an early peace settlement. The surprise military strike appeared successful and caused massive damage, but US aircraft carriers were not damaged in the assault. After the attack the Axis alliance initially saw advances without any defeats. By April 18, 1942 (Show Period 17), formations of U.S. B-25B bombers, flown from an U.S. aircraft carrier, attacked the Japanese mainland for the first time. The Japanese military responded by carrying out their Midway operation, but that strategy failed. As a result, the Japanese military lost 4 aircraft carriers. The U.S. army were encourage by the victory against Japan and proceeded to carry out a landing operation on Guadalcanal. The Japanese and U.S. military fought fiercely. Besides the toll from fighting the U.S. military, the Japanese military suffered from starvation, dehydration and diseases while on Guadalcanal. The Japanese military were nearing collapse on Guadalcanal before Isoroku Yamamoto gave the order to withdraw to save more lives. After the completion of the withdrawal from Guadalcanal, Isoroku Yamamoto flew on an airplane to make moral boosting visits to soldiers on the front line. His plane would be intercepted by the U.S. military. Based on the life of Isoroku Yamamoto - Japanese Naval Marshal General and the commander-in-chief of the Combined Fleet during World War II. 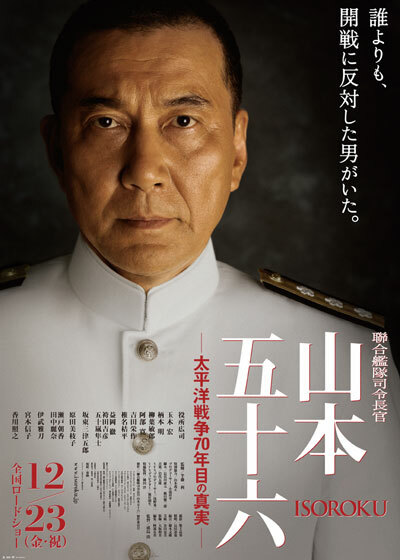 Showa 20 Nov 15 2011 8:11 am Most people know Admiral Yamamoto as the main architect of the Pearl Harbor attack, and yet only a few people know that he has an encyclopedic knowledge in geography, that's why he also subscribed to the best geographical journal in the 1930s- National Geographic.